Cases, cipramil (celexa) stories,, lundbeck, Newspaper and internet articles, Shanes story. I never expected my life to turn out like this. Before Shane died, I was happily rambling along minding my own business (I was, I swear!). There are more and more compelling arguments that Citalopram and other SSRIs can cause people to kill themselves and others. Don’t let it be you or your family. Be aware that these type of drugs are powerful mind altering drugs. Do not believe lazy doctors who spout the ‘chemical imbalance’ rubbish. We were not born with an inherent defect that only the pharmaceutical industry can save us from. These supposedly ‘safer’ drugs can kill in overdose. They can cause heart attacks, stroke, suicide, homicide, birth defects, et cetera. Thank-you to John Breslin and Iain Harrison for writing this article. I was happy to be interviewed for it. 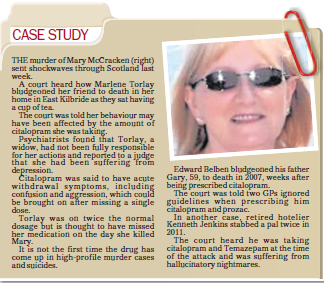 Thanks also to Mike Schoger who captured the article for me; his lovely mum died as a result of taking her prescribed Citalopram. The Teratogenic effect of SSRI’s including Citalopram. Teratogen; An agent, such as a virus, a drug, or radiation, that can cause malformations or functional damage to an embryo or a fetus. In Ireland women get very little warning about the teratogenic effect of these drugs. Psychiatrists and GP’s seem reluctant to voice their opinion one way or the other. Whether this is because they don’t want to bite the hand that feeds them or because they believe the drug company spiel is anyone’s guess. Either way, spouting about the benefit/risk conundrum is clearly a get-out clause while in the meantime babies are dying. In 2010 there was a Case in the High Court, where a little girl’s parents alleged that the disabilities she was born with, were caused by prescription drugs taken by her mother during pregnancy. The Case was settled without admission of liability for €500,000. Article. Here is an excerpt from Professor Healy’s talk “The Cardinals Of Psychiatry” Full Paper here. We are facing a true tragedy – a system put in place with the best of intentions to prevent injuries from drugs in general but symbolized in particular by injuries to babies in utero is now leading to just the outcomes it sought to avoid. In the case of the SSRIs as the evidence mounts that these drugs cause birth defects, doubling the rate of major malformations, doubling the rate of miscarriage, increasing rates of voluntary terminations and more than likely leading to learning disabilities/autism in a significant number of children born to mothers on these treatments, we have nevertheless a mounting use of these drugs. 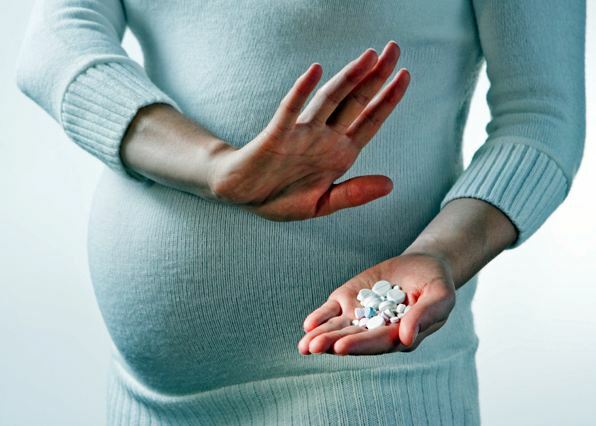 Where antidepressants were once used rarely in pregnancy they are now among the most commonly used drugs – up to 15% of pregnant women. This use is actively promoted by our Cardinals, who collectively make it almost impossible for articles to get published drawing attention to the issues. It is a world where articles can only get published in Vogue or other such outlets – outlining the case of Gina Fromm who for instance when she became pregnant in 2004, did a range of things that few women would have done in 1962 – she took cold rather than hot showers in case she might harm her baby, stopped eating yoghurts and incinerated any chicken because of the risk of bacteria from listeria to salmonella. She balked at taking prenatal vitamins, though she had been taking Paxil following a fleeting episode of anxiety. She continued to take it through her pregnancy; she had found stopping difficult and her doctor reassured her it posed no risk to her baby. On February 2nd 2005 her son Mark was born with congenital heart defects. The Death of the baby in the IMB e-mail was associated with Cipramil. We asked Lundbeck if their drug was a Teratogen. 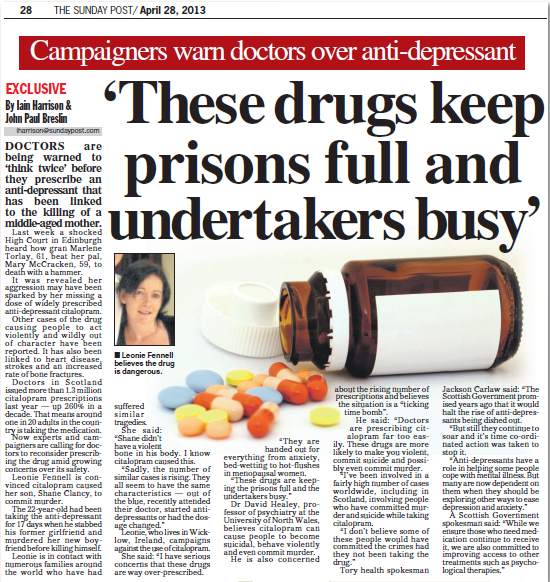 Although they seem to admit it, here is a prime example of drug company spiel…. Leonie Do you think that it’s advisable to virtually bathe foetuses in Serotonin given it is now accepted this family of drugs are firmly associated with birth defects? Leonie Foetuses in Serotonin – pregnancy. Leonie I’m talking about anti-depressants are known to cause birth defects. If you think so, would it not be better if women of child-bearing age were cautioned against, perhaps even contra-indicated from using this drug? Citalopram or Escitalopram? Dr. Madsen Em, I think in…..
Mr. Schroll the medicines agency authorities you can see what is in the checks that the Doctors and that is up to them to decide…..
Leonie So you are passing the buck back to the Doctor again. Leonie And will they be told that it can harm their unborn baby? Leonie Will the pregnant woman be told that the drug can, can harm her unborn baby? Dr. Madsen Em, I think em, physicians need to double their efforts to make sure that there is a correct risk versus eh, benefit eh, assessment of the em, of any action. Leonie Is Citalopram and Escitalopram a teratogen? Dr. Madsen Em, meaning, what, what, what do you mean? Leonie Can it cause harm to foetuses? Unborn babies. Leonie Can it cause harm…..to unborn babies? Leonie So yes it can. Leonie Yep…………Em, why if it can cause harm, is this not clearly, clearly stated on the packaging and information leaflet? Mr. Schroll Do you talk about the patient leaflet or do you talk about the SPC, the label that the Doctors use in order to prescribe the medication? Leonie I’m talking about a pregnant woman that goes down and gets it in the chemist. Is it on the patient information leaflet? Mr. Schroll In the patient leaflet it says you have to talk to your Doctor…. Leonie And what does it say in the Doctor’s leaflet? Mr. Schroll It would be part of the discussion to talk about the risks and the benefits and that would be up to the Doctor. Leonie It would be up to the Doctor to tell them that the drug can harm their unborn baby? Mr. Schroll Eh, now, you’re talking…..
Leonie It’s not up to Lundbeck, no? It’s up to the Doctor to tell the woman that the drug can harm their unborn baby? Mr. Schroll To be cautious, yes, yes. 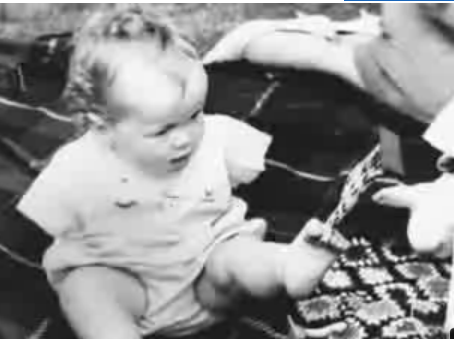 Thalidomide, still in Ireland and other countries…surely not? Teratogen: Any agent that can disturb the development of an embryo or fetus. Teratogens may cause a birth defect in the child or a teratogen may halt the pregnancy outright. The classes of teratogens include radiation, maternal infections, chemicals, and drugs. O.k. so I know I’m going off track but I have come across some information from the Irish Medicines Board today about Thalidomide and can’t believe this poison is still being licenced in Europe. I had thought (along with most people) that this drug was banned years ago when it was found to have devastating teratogenic effects, leaving an estimated 10,000 to 20,000 babies with malformed limbs in it’s wake. Thalidomide is quite possibly the most notorious drug of all time and is being prescribed again for various conditions including leprosy, and Multiple myeloma (cancer of the blood) in Ireland and in other countries. It would surely beg a few questions, exactly what does it take to get a drug banned in this country? Has it got miraculous powers with leprosy and Multiple myeloma which could possibly explain why this drug is active again? Why on earth are peoples lives being risked again in 2011? The letter also states “Adverse events (and cases of suspected or confirmed pregnancy and foetal exposure) should be reported“. Surely not? Must be just a bad dream!